Players in Russia are not allowed to deposit at this casino. This is a definitive SlotsMillion casino review. It makes no sense to play only at one particular casino, but if I had to choose one for 2019 then it’ll be this one. I’d easily find all the latest and most popular releases from top developers among its 3,057 or so games. Have a blast with their awesome VR casino. All that while having the tools and a responsive customer support for added peace of mind and control. It’s for these reasons it just renders most other sites a waste of time and has one of the best ratings among players worldwide, including the UK and Germany. Featured in the 10 Best Mobile Casinos list. Software – Novomatic, WMS, Bally, Shuffle Master, Scientific Games, Barcrest, NetEnt, Microgaming, IGT, Play’n GO, Thunderkick, Pragmatic Play, Merkur, Betsoft, Leander, Skywind, Rival, Noble Gaming, MGA, Realistic Games, 1x2gaming, Genesis, Casino Technology, EGT, Nolimit City, Felt, Just For The Win, Iron Dog, Gamevy, Foxium, Zitro, Amatic, Push Gaming, Fuga, Wazdan, Felix Gaming, Quickspin, NextGen, iSoftBet, Red Tiger Gaming, ELK Studios, Yggdrasil, Lightning Box, Big Time Gaming, Playson, Rabcat, 2 by 2 Gaming, Ainsworth, Wagermill, Saucify, Red Rake Gaming, Booongo, Core Gaming, Bally Wulff, Gameslab, Betdigital, Gamomat, Games Warehouse, Relax, MetaGu, Kalamba Games. T&C: Bonus Spins can be used on Starburst only and must be wagered 35x to cash out winnings. The maximum win limit is £/$/€100 or 1,000 kr. No code needed – use the link. New 18+ players only. Gamble responsibly. Full T&C apply. Here are some quick facts to know before play. Games, games, games – over 3,000 of them at the moment! As you can see, you can try the SlotsMillion online casino for free and without fuss. 🔔 Sign up here and get 10 Bonus Spins on Starburst*. No bonus code required, just register through that link, which will give you a better bonus. *Eligible countries for the signup bonus: Sweden, Norway, Finland, Iceland, Ireland, Luxembourg, New Zealand, South Africa, Switzerland. Also note that any winnings from those spins must be wagered 35x and the maximum win limit is £/$/€100 or 1,000 kr. Remember to claim them within the first 24 hours before they expire. ☀ SUMMERMILLION PROMO: A popular bonus campaign that started last summer has been extended until further notice! Better yet, they increased the prize pool from 10,000 to 15,000 Extra Spins. Find out how to claim your share of that every week in this step-by-step guide. But we’re just getting started — here’s more for the pro-active players. If you like what you get for the registration bonus, then here’s to get you up and running with even more coins on the house, with a welcome bonus. 💎 Learn more: Get 100% match up to €/£/$100 with 100 Bonus Spins on 1st deposit. Day #1 – deposit up to €/£/$100 and play with up to €/£/$200 in total + 20 Bonus Spins on Gonzo’s Quest that you get right away. Days #2 — #5 – then you’ll get another 20 Bonus Spins each day on Twin Spin, Jack and the Beanstalk, Spiñata Grande and Fruit Shop, in that order. Remember to activate them manually within 24 hours in the lobby (see video above). Max bet per spin €/£/$5. Max Bet Protection (aka Bonus Guard): Should you accidentally go over the max bet limit, you’ll automatically get a warning. This means you can play with peace of mind and don’t worry about getting your wins confiscated when you accidentally bet over the €/£/$5 limit. New 18+ customers only. Gamble responsibly: BeGambleAware®. What can I say about this bonus? — It’s a fair deal with average wagering requirements. However, if you’re not happy to see any rollover terms, then make sure to check out its sister site, Casino Secret which is giving away real money cashback. 👨‍💻 Full T&C: Learn more about the 100% bonus and 100 Bonus Spins. 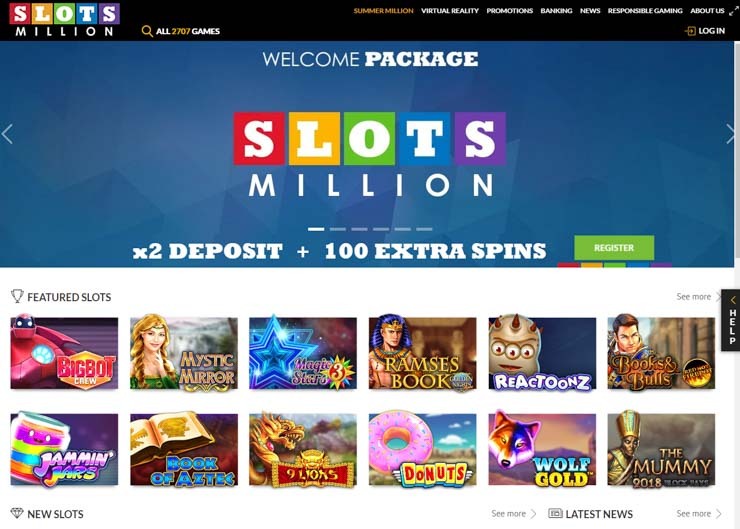 On top of the welcome offers, SlotsMillion casino has one of the best loyalty deals too. The more you play, the more you get. Knowing how passionate they are, VIPs and high rollers are guaranteed exclusive deals that are hard to say no to. Here’s a quick rundown of the 5 recurring casino campaigns. Get more freebies and up to 50% reload bonuses every week. Each week they are giving away from 20 to 100+ Bonus Spins to keep the fun going. How much you get depends on how active you are. Simple as that. Every Friday, between 7pm — 11pm CET, SlotsMillion has a surprise for you. Make a deposit between those 4 hours and you’ll get 50% extra up to €/£/$100 (no withdrawal limit on the winnings). So if you deposit €/£/$200, you’ll be able to play with a total of €/£/$300. Just remember that the winnings must be wagered 48x and you must have deposited once before (claim the welcome bonus first). Are you a high roller and that €/£/$100 cap is too small? Get in touch with them for a custom deal at support@slotsmillion.com. Between Mon – Fri each week there’s one more surprise. Every time you’ll make a deposit €/£/$20 or more between 11am and 1pm CET, you’ll get 20 Bonus Spins. Wagering requirement of 48x applies. Deposit at least €/£/$25 on Wednesday (7pm—11pm) and get 40% extra up to €/£/$100. So if you deposit €/£/$250, you’ll get a total of €/£/$350 to play with. The wagering requirement of 48x bonus applies as usual. Ladies’ and Gentlemen’s Nights on Mondays and Wednesdays. Finally, here’s something for ladies. Deposit at least €/£/$25 on Monday (7pm—11pm) and get 25% extra up to €/£/$25. 🍹 SlotsMillion promotions: More info about ongoing promos here. Bonuses go hand-in-hand with real money, so here’s how quickly you can get it in and out of your SlotsMillion account. SlotsMillion is one of the highest-rated online casinos for a good reason, including lightning-fast cashouts. That includes over a dozen of banking methods, like Visa, MasterCard and Maestro, as well as Skrill, Neteller, Ukash, paysafecard, Zimpler, ecoPayz, Trustly and wire transfer. The more localised payment methods, like mobile payment (Siru) for Norway, Sweden and Finland, SOFORT and Giropay for Germany, and iDEAL for the Netherlands, are at your fingertips as well. When it comes to withdrawals, most of them are processed within 24 hours (some within minutes). Be sure to have the necessary verification details with you for cashouts over €2,000 (EU laws). Unfortunately, their finance department doesn’t work during weekends. On the upside, wire transfers are instant for players from Norway, Sweden and Finland. Better yet, all payments are free. And to avoid currency exchange fees, then now accept not only EUR, USD, CAD and AUD, but also NOK and SEK. You can enable it easily within Lobby to flush your cashout. There’s one new feature as of 2017 – Withdrawal Lock. Tempted to reverse your money when it’s pending? Use that tool in your Lobby to avoid any regrets. Simple as that. Now that you’re all set, here’s the fun part. This is the invention that got SlotsMillion casino nominated for the best In-house Product of 2016. It’s also what got them the Innovation of the Year award. It’s the SlotsMillion Virtual Reality casino, and you don’t need expensive gadgets to try it in 3D right now. No fancy headsets needed — play VR casino on your PC or Samsung mobile. Desktop app – Download the SlotsMillion VR Casino app and play on your PC. Oculus Gear VR – Cheaper and works with Samsung GALAXY smartphone. Xbox controller – Use it with your Oculus gear to navigate more easily. Keyboard – Don’t have the controller? Use your PC keyboard instead. Oculus Rift – Get this headset for the ultimate VR experience. 🎮 SlotsMillion VR: Visit SlotsMillion Virtual Reality to get the free software. Play’n GO — GEMiX, Tower Quest. More games from ELK Studios, Pragmatic and Rival are also in the mix. While VR gaming is yet to catch up and is more of a fun addition, the operator has an in-house team of 10+ wizards, who launched an even more realistic 2.0 version of the VR Casino in 2017. Updated VR Casino experience now available with more realism. If you want to take it to the next level, then invite your friends over to the casino using a multiplayer mode. All in all, it’s a game changer, which youp can’t experience anywhere else. SlotsMillion casino now has table games (over 370 of them). Yes, they finally did it, introducing classics like poker, blackjack and roulette, as well as scratch cards, bingo, keno, and more. Among the RNG versions, they also added live casino in June 2017, featuring bespoke NetEnt live dealers behind your favourite tables (with low and standard limits). This means the total number of games has grown beyond 3,057 titles, over 2,000 of which are mobile-compatible. And this number keeps growing by 5-10 slots each month. Note that some may not be visible in your country due to regulations. Play over 3,057 games from 90+ iGaming studios! As of Q1 2019, they have over 90 licensed and certified iGaming studios. Spot anything interesting from this list? Novomatic, WMS, Bally, Shuffle Master, Scientific Games, Barcrest, NetEnt, Microgaming, IGT, Play’n GO, Thunderkick, Pragmatic Play, Merkur, Betsoft, Leander, Skywind, Rival, Noble Gaming, MGA, Realistic Games, 1x2gaming, Genesis, Casino Technology, EGT, Nolimit City, Felt, Just For The Win, Iron Dog, Gamevy, Foxium, Zitro, Amatic, Push Gaming, Fuga, Wazdan, Felix Gaming, Quickspin, NextGen, iSoftBet, Red Tiger Gaming, ELK Studios, Yggdrasil, Lightning Box, Big Time Gaming, Playson, Rabcat, 2 by 2 Gaming, Ainsworth, Wagermill, Saucify, Red Rake Gaming, Booongo, Core Gaming, Bally Wulff, Gameslab, Betdigital, Gamomat, Games Warehouse, Relax, Kalamba Games. So how do they manage that many games? Whether on desktop screen or mobile, navigation and browsing are flawless on both. This is where lots of handy game filters come in. Paylines (1—15, 16—25, 26—50, 51—infinite). And yes, these work on SlotsMillion’s mobile site too. What’s more, they have more than 25 mobile progressive jackpot slots, including the life-changing Mega Moolah and Mega Fortune. 👍 Did you know? 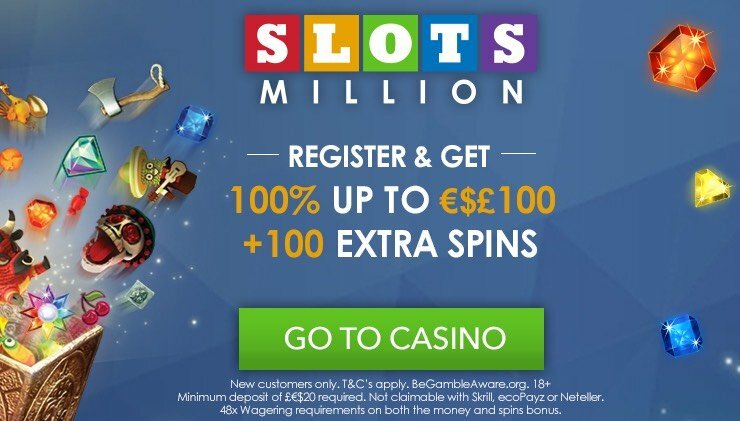 — The first SlotsMillion millionaire is a UK player who triggered just over £2.2 million on NetEnt’s Mega Fortune slot in January 2018. Lucky guy indeed! You can read the full interview here. There’s no download required as you can play right in your browser in Flash or HTML5, in demo or for real money. But SlotsMillion innovations don’t end there, as they have one more surprise for 2019. SlotsMillion Slot Tournaments are coming soon! 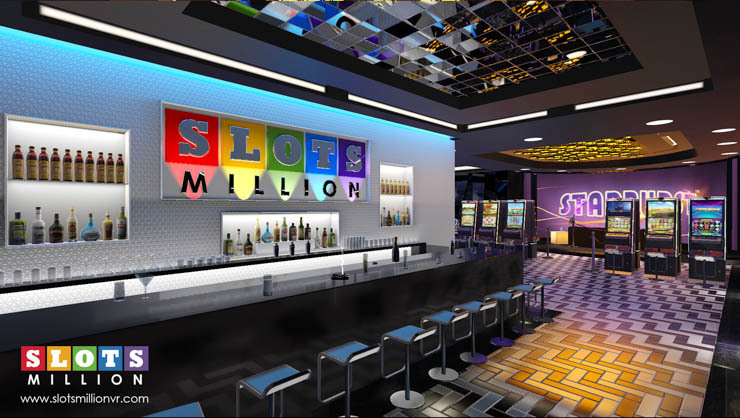 SlotsMillion’s very own slot tourneys are in the works and will launch in full scale sometime in 2019. Register for the match before it starts. Get “match credits” to play the games. The higher you score, the better your ranking. 1st, 2nd and 3rd place wins 50%, 30% and 20% of the real prize pool. Note that they are yet to launch the tourneys on full scale sometime in 2019, so keep your eyes open. 🏁 More details: Visit SlotsMillion’s Tournaments page. If that’s what you like, then you can also test your competitive skills with Cashmio Champions and Casumo’s Reel Races. 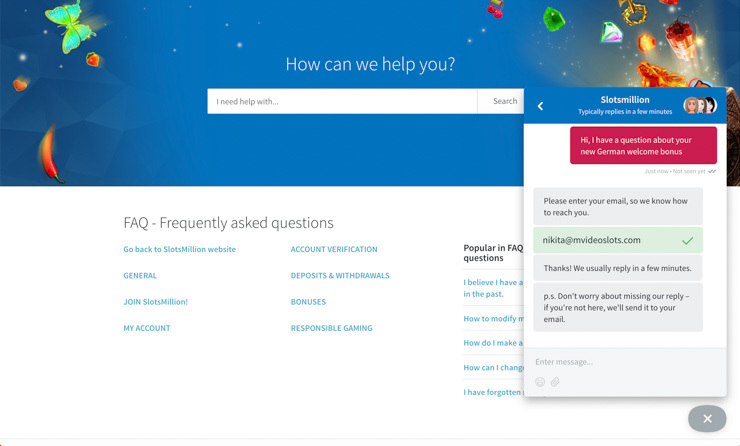 New customer service area with live chat and FAQ. Should you need any help with the banking, verification or VR gaming, then they are at your service every day. And in February 2017, SlotsMillion’s customer service times got extended. They are now available from 10am till 11pm CET, every day. You can reach out to them directly via live chat, which is now also available for guests who are just visiting on both desktop and mobile, or via email which they respond to daily. If you prefer to speak to them via phone then you can ask them to call you back. As far as I know, their agents speak not only English but also other languages like German. Virtual Reality casino 2.0, Slot Tourneys, improved banking and customer service. Players’ reaction to SlotsMillion has been second to none. During late 2016 and early 2017, they’ve improved the VR casino experience, added more banking options, two player protection tools like Withdrawal Lock and Max Bet Protection, and finally added well over 370 RNG and live table games to the vast selection of slots. As if that wasn’t enough, they’ve also made a big announcement by going live in Germany and the UK market; acquired LadyLucks, one of the UK’s most recognisable mobile casino brands, and launched Casino Secret in late 2018 which offers wager-free Cashback on every losing bet. More weekly deals – Get more Bonus Spins and up to 50% reload bonus with no winning limits every week. Fast and free banking – 13 banking options, 6 currencies, free payments processed in 24 hours or less. First Virtual Reality online casino – The only 3D VR online casino, no fancy headset required if you don’t have one. Slot Tournaments – Compete for real prizes by doing what you enjoy, to add some more spices. Over 2,900 games – Huge number of titles from 90+ developers, including RNG and live table and card games, which you can sort with ease thanks to the many content filters. Daily customer support – Available 10am–11pm, via email, live chat or phone. Rated between 8-10 across the Internet, SlotsMillion Casino is a safe bet, partly because I’ve also chosen them as my 🏆 #1 overall online casino for 2018. 🔥 Grab before too late: Click here to get the exclusive 10 Bonus Spins on signup. P.S. For more behind-the-scenes details, VR gaming and future plans for the company, check out the exclusive interview with the co-founder Alex Tomic HERE. Got any experience with SlotsMillion.com? I’m really excited to hear how it worked for you. Just leave a quick comment below to add to the overall review and your score above for fair rating. T&C: The exclusive Bonus Spins have a wagering requirement of 35x. The 100% match bonus up to €/£/$100 must be wagered 48x the bonus amount. New 18+ players only. Eligible countries for the exclusive signup bonus: Germany, Sweden, Norway, Finland, Iceland, Ireland, Luxembourg, New Zealand, South Africa, Switzerland. Gamble responsibly. Full T&C apply.